Last round pairing which ended in a draw between John Donaldson and Paul Bartron. Photo Credit: Vivi Bartron from a facebook post. 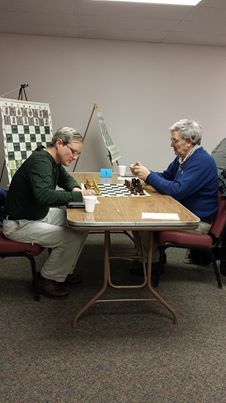 International Master John Donaldson of Berkeley California once again had the top score at the Collyer tournament, 4.5-5. But he was not the only one with that score, Paul Bartron of Tacoma and Mark Havrilla of Moscow Idaho also tied for first place. Three players had 4-1 scores: Timothy Moroney of WA, Cameron Leslie of Moscow and Nikolay Bulakh of Spokane. 50 players took part under the direction of Kevin Korsmo of Spokane. Sponsors of the tournament were the Spokane Chess Club and the Gary Younker Foundation. The playing site was St. Anne’s Children Center in downtown Spokane. CLICK HERE for the Spokane Chess Club website.